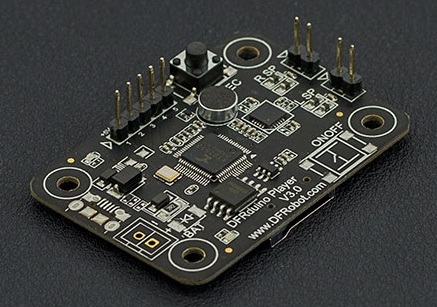 The DFRduino Player MP3 module is designed to give your project speech. The DFRduino player V3.0 is based around an ATS2513 chip and supports recording and Chinese TTS voice synthesis. The board supports a greater range of SD cards up to a maximum of a 32GB TF card. Audio is output in stereo. There is a 2-way power amplifier output and the board is able to drive a speaker up to 3W. The chip can decode MP3 files without using up any Arduino resources. All you will need is a TF card and a speaker. The "OUT" port will output a high pulse after the end of each song. Green LED: Normal ON after successful initialization, if an SD card is not inserted or the SD card is corrupt the indicator light will keep flashing, at the same time, the serial port will output "Please check micro SD card \ r \ n"
Serial port mode, baud rate @19200 bps, 8, N, 1 format. Communication instructions use a string form, "\r\n" express a enter newline character , it will get the return value of a string form after sending the command. Record \:r\r\n Return record\r\n After turning on the mic to start recording, the module will no longer support among other control commands, unless sent \ : e exit recording applications. Press and hold the REC button and speak into the microphone, release the REC button after finish. Format the SD card as FAT32 on your PC, store audio files on the root directory. Wire according to the connection diagram, We recommend using external power supply to power the microcontroller. Wire according to the connection diagram. We recommend using an external power supply for the microcontroller. / /voice file name no more than eight English alphabets  , four Chinese. There are no questions about this product yet. If you have any problems or suggestions you are welcome to post on the DFRobot forum. 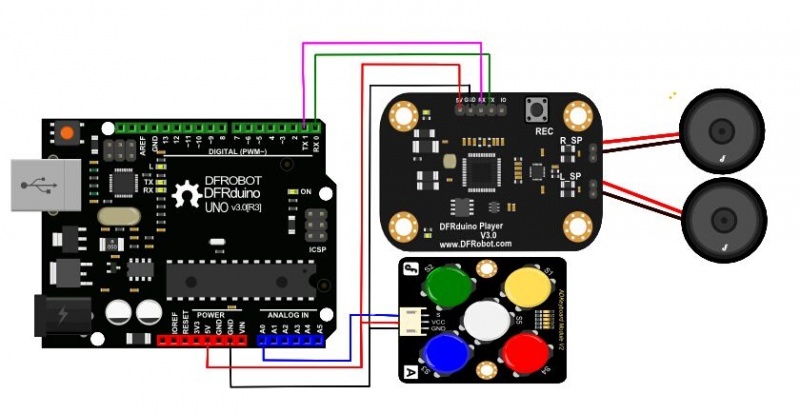 Get DFRduino Player MP3 from DFRobot Store or DFRobot Distributor.